Configuring NAT (Network Address Translation) on a Cisco 1921 Router. | Chinny Chukwudozie, Cloud Solutions. ← Configuring Network Adapter TCP/IP Settings using Powershell 4.0 Cmdlets . Configuring NAT (Network Address Translation) on a Cisco 1921 Router. 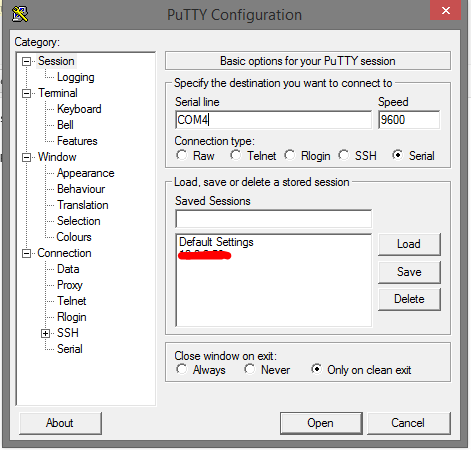 1) Open the Putty application and select the Serial Port Connection Type to logon locally to the router device. Edit the Com port number to your settings and click Open. I’m using a Serial-to-USB adapter with the Router Console cable. 2) You will be prompted to enter the initial configuration mode. Type no and enter. LabRouter(config)#access-list 20 permit any ? This is a basic standard access list that is set to permit any traffic. LabRouter(config)#ip nat inside source ? LabRouter(config)#ip nat inside source list 20 ? LabRouter(config)#ip nat inside source list 20 interface ? LabRouter(config)#ip nat inside source list 20 interface GigabitEthernet 0/1  ? This entry was posted in Access-Lists, Cisco, NAT, Network Address Translation, Router and tagged ACL, Cisco, IOS, NAT, Router. Bookmark the permalink.